Have you heard of the 3 musketeers? Well, now you can be one of them in this 5 reel, 20 payline slot! 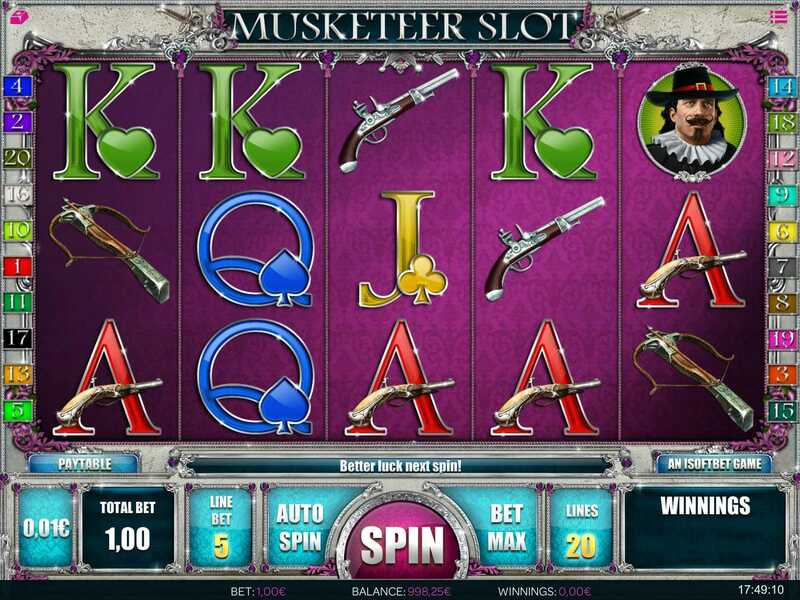 Musketeer Slot is an exciting Online slots casino in which you'll join the famous trio on their journey to fight for what's right. The visuals and gameplay are simple yet fun, bright and exciting. You'll spin your way though pistols, bow and arrows and moustached musketeers in order to get yourself amazing rewards in the form of free spins, bonus wilds and cash. Have a look at other Online Slot Game on SlotsBaby! Get the most out of slot offers when you play! 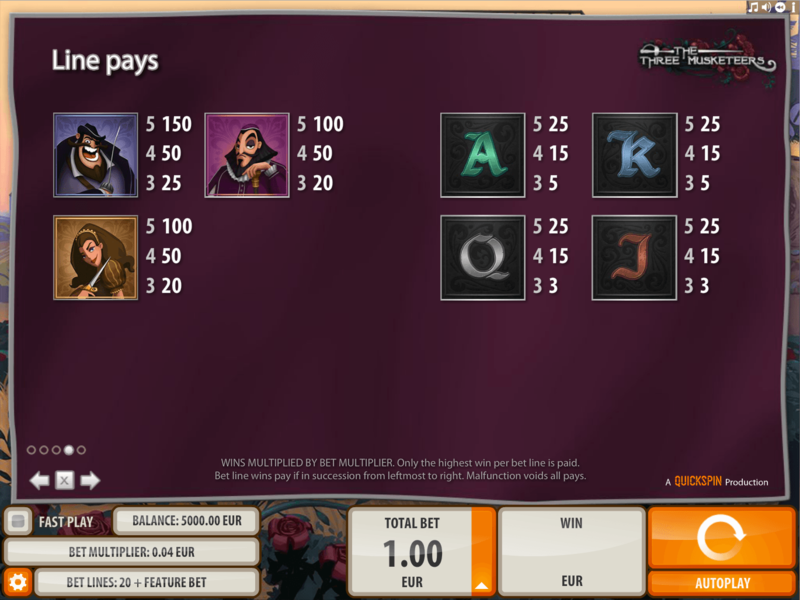 Musketeer slot is a musketeer themed game with 5 reels and 20 paylines which will have you feeling like a true hero by the end. Behind the reels you'll see a very simple light grey/silver background. The symbols are placed onto a very bold, royal purple coloured screen making the simple design of the symbols stand out. The symbols are obviously all musketeer related and include items such as guns, bow and arrows, colourful letters, a grand castle and of course, the three musketeers themselves. The Wild Symbol - The wild symbol in this slot is the beautiful grand castle and is a real game changer. The wild can replace all other symbols apart from the scatter and will create winning combinations for you. This mysterious castle can also randomly appear on the reel at any given time throughout the game and will turn any of the reels into extended wilds. The Scatter Symbols - The scatter is the mysterious masked lady. If you locate 3 or more of these symbols then you will be awarded with a win. If you find 3 you'll gain 10 free spins, spot 4 and you'll get 15 free spins and if you're lucky enough to find 5, you'll win 20 free spins. As a nice little bonus, a multiplier of 2x or 10x will be added to your winnings from the free spins - how mysterious!